The Schools Linking programme in Derby is led by Global Education Derby and they’ve been linking since 2017. We wanted to share some stories of their Schools Linking work so far. 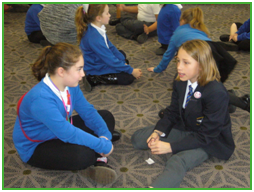 Darley Dale Primary School, Derbyshire (Y5) and St Giles (Special) School, Derby The first meeting between the children at Darley Dale Primary School and St Giles School was held at Pride Park Stadium. The programme was adapted to ensure that all children could achieve and develop their skills within each activity. The Headteacher of Darley Dale thought this adaption was particularly helpful for the children who attend Darley Dale as this showed them a range of differing needs other children may have, even though they were of a similar age. The final link day took place at St Giles’ School where the successes of the Programme really began to stand out. Over the course of the year the children developed empathy and understanding of similarities and differences; we saw evidence of this: when the children were playing on the playground together – many of the Darley Dale children adapted their games so that the children of St Giles could join in easily. The class teacher of Darley Dale was particularly impressed with how her children had deepened their understanding of diversity and was keen for them to rejoin the Programme for the following year. Both schools felt that the partnership had been successful and as a result wanted to host an additional activity day, such as a picnic, at a location between both schools. A Darley Dale staff member was heard to say “This is the best thing we have ever done!”; the partnership will be continuing. Both of these schools are Derby City Schools though they have some obvious differences; they are housed in very different buildings (Akaal is on a temporary site with very little outside space and is a fairly new school); Akaal is a faith school; Lawn is a larger, mixed and more diversely populated school, based in a more affluent suburb. From the first link day at Pride Park Stadium, the Lawn and Akaal children immediately ‘hit it off’. This was a sign that the children had been sufficiently prepped for the meeting. They were the first school partnership where the children choose to eat their lunches together in the ‘neutral’ space, rather than their dedicated zones, indicating an eagerness build relationships with children from the other school. The schools continued to communicate in between visits, sharing videos, pieces of work and rehearsing stories and games in preparation for the next meeting. For the school to school visit days, both schools showcased their building through treasure hunts and a wide range of varied activities. When Lawn Primary visited Akaal Primary, the children of Akaal were very eager to share their faith with their visitors. Enthusiastically teaching the Lawn children about the 5ks, through an interactive talk and using the Sikh bear in their class. The children also were excited to take Lawn Primary to their Gurdwara adjoining the school building and were happy to show them how they pray and what happens inside this special building for Sikh people.